I lost 50+ pounds a couple years ago and I did it through hard work and dedication, not scams like Teatox. Here’s an article I wrote for Urban Male Magazine that was published in their Spring 2011 print edition. Every year the food industry spends billions of dollars advertising with talking tigers and dancing leprechauns to distract you from the ugly truth—most convenience foods are junk. My Dad always says, “Food is fuel: You wouldn’t put diesel or swamp water in your Porsche, so why put poor quality food in your body?” Makes sense. Healthy food Chef, David Chudak from Toronto, Ontario gives us some healthy snack ideas that prove you don’t need inconvenient diets or bizarre supplements to put high-octane fuel into your body. Unbuttered popcorn is a low fat whole grain that contains tons of nutrients and more protein than any other cereal grain. Kick it up a notch by drizzling your favourite hot sauce on top. Spicy foods contain a compound called capsaicin, which can pump your metabolism up by 25%. Men have the tendency to eat whatever is in front of them, so if you don’t have one already go out and buy a fruit bowl and fill it with a playful variety. Fruit is a delicious portable snack that’s oftentimes low in calories and rich in nutrients. Chef Chudak warns, “Stop buying additive filled trail mixes! Make your own by mixing one good kind of nut (walnuts, almonds) and one dried fruit. Maybe even a bit of dark chocolate, but remember it’s a calorie dense food so eat in moderation.” Don’t let the fat content of nuts scare you too much, as monounsaturated fat is good for the heart. Walnuts, for example, are a great source of omega-3 essential fatty acids and also contain antioxidants that fight cancer and boost your immune system. Not getting enough water kills your metabolism. Most dieticians recommend 8 glasses a day, which can get a little redundant, so Chef Chudak suggests, “liven up your water with a wedge of lemon, it’s an appetite suppressant, and also a natural cleanser.” If you think you’re drinking enough water, drink more. This can be tricky to find in Canada but it’s worth the trouble. The Greeks skim off the whey, which leaves a thick and extremely high in protein yogurt. Protein is a powerful calorie torcher and simultaneously builds muscle and makes you absorb sugar slower. Most diets warn you away from cheese, but 1% or 2% cottage cheese is low in fat and a great source of Vitamin B12 and protein. Mix in some diced tomato, green onion, fresh dill, salt and pepper and you’re good to go. Best of all, it’s low in carbs so don’t feel guilty using this as a midnight snack. Just because your friend buys you a beer, doesn’t mean you have to drink it. Nevermind, yes it does. 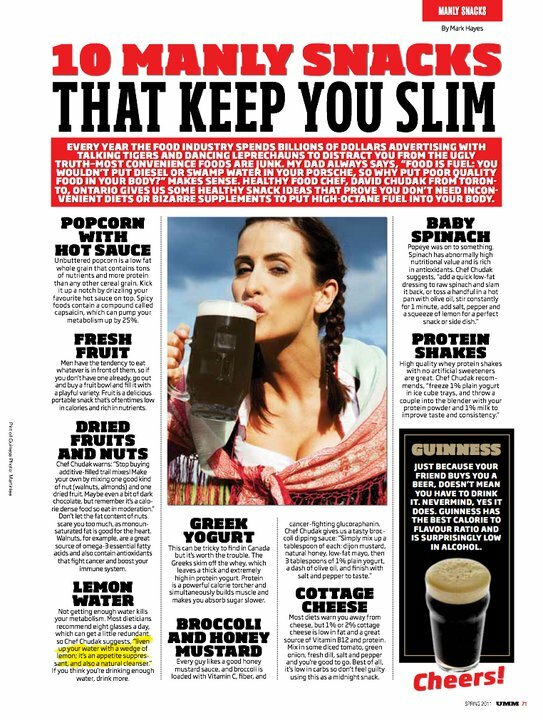 Guinness has the best calorie to flavour ratio and is surprisingly low in alcohol. Cheers!